I sent variations of the following letter to the judge and the prosecutors. In the interest of full disclosure and to raise awareness, I am also publishing it here. During September 23, 2011 voir dire process, Defense Attorney Ed Chernoff objected to the verbiage “victim” used by David Walgren in his questioning of the veniremen. “There is no proof of a victim” Ed Chernoff argued. Consequently, judge Pastor instructed the prosecutor to use the term “alleged victim” instead. in this Trial, the scientific distinction between sleep and anesthesia isn't open to debate. "It is neither indicated nor approved for use as a sleep aid"
a characteristic pattern of EEG behavior while Propofol does not. Sleep, in general, preserves blood pressure and the ability to breathe and Propofol does not. 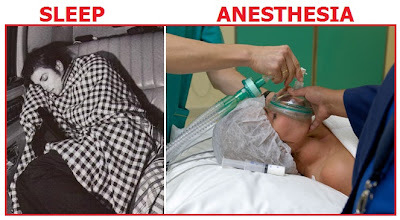 “The ‘sleep’ you experience under general anesthesia is different from regular sleep. "Your brain is in a completely different state in sleep compared with being in a coma or general anesthesia and the differences are not subtle. It is apples and oranges. If you are deeply asleep, I can eventually shake you awake. In a state of general anesthesia that won't happen. Surgery is invasive and traumatic and you need to be in a state that is like a coma to tolerate it. The goal of treating insomnia is to promote natural sleep but sleep is a cycle as your brain moves between REM and non-REM sleep. That is why people who take a sedative may wake up and still feel groggy. They haven't been through the natural stages of sleep necessary for the body to recover. the counsel knows or should know that the anesthetic Propofol doesn’t induce “sleep”. For the purposes of this letter, I am only using Christopher Rogers’ pretrial testimony. Mr. Flanagan replied “asleep” -NOT an accurate depiction of Mr. Jackson’s state. The use of erroneous verbiage in the upcoming Trial will be misleading to the jurors. The substandard medical care provided by Dr. Conrad Murray to his patient Michael Jackson is the heart of the People’s charge. The use of Propofol for the treatment of insomnia is unprecedented and it is at the forefront of the deviations from the standard of care. Jurors who hear the terms “sleep” “asleep” “wake up” “awake” in connection with Propofol for the entire duration of the Trial will be desensitized to the serious nature of this deviation. It simply downplays and misstates the clinical effects of Propofol. vis-à-vis Propofol and its indications would be socially irresponsible of the court. If Casey Anthony Trial thought us one thing, it is that the prosecutors who have extensive knowledge of the case shouldn't assume that the jurors know the particulars of the case. The prosecutors in this Trial should be vigilant about tiny details that will deliver a huge impact. If one of the arguments of the People is that Propofol isn’t used to induce sleep then does it make any sense to use “sleep” while referring to its effect? "Only close attention to the fine details of any operation makes the operation first class"
While the continuation of the incorrect usage has adversarial effects on the Prosecution's case and they should be the ones to review and take the necessary legal steps to ascertain proper usage of the medical terms, it ultimately is Judge Michael Pastor's court and he is responsible that his court doesn't unwittingly misinforms a large population about Propofol. 25mg of Propofol would induce sleep for approximately 5 minutes, wouldn’t it? So within a minute after injection, it would take effect. The person would be asleep. If there was no further Propofol given, you would expect that person to wake up very rapidly, wouldn’t you? If it was 3-5 minutes and the 25mg was a transcription error, you would expect the patient to go to sleep for a period of maybe 5 minutes and wake up, wouldn’t you? Now in the event that a person were to wake up after 5 to 10 minutes and ingest Propofol to get—first of all, stomach ingestion is only about three quarters as IV, isn’t it? First the doctor has to start the Propofol, the doctor has to leave and then at some point, Mr Jackson would need to wake up….. If Dr. Murray gave a 25mg injection of Propofol over a period of 3-5 minutes, you would expect it to produce sleep, would you? And the sleep, if it has been based upon Propofol, would be very short-lived, wouldn’t it? A person would be totally reasonable in assuming that after 5 to 10 minutes of sleep, that the sleep is no longer being produced by Propofol? Now, she also says if it were only a bolus injection, sleep would not have been maintained due to the short action of Propofol, do you agree with that, too? But you would agree that if the patient was being kept asleep by Propofol and the only injection the doctor gave was between 10:40 and 10:50, would you expect the patient to be awake within 5 minutes? In the event that you get Propofol level to the blood levels we see here, you would anticipate a rapid onset of, I don’t know If call it sleep, deep sleep or anesthetic state, you would expect a rapid onset, wouldn’t you? So even if Dr. Murray gave more than 25mg between 10:40 and 10:50, we still have the same result. Mr. Jackson would be awake at 11:00 if he was being kept asleep by Propofol, correct?